You're a Boilermaker and you've moved to New York - now you've got a lot to figure out. The Purdue NYC Alumni Club is here to make the city feel just a little bit smaller. Join us for social events, to meet fellow Boilers, and to support our teams from 765 miles away. We'd love to see you at our next event! Hail Purdue! Thank You to All Incoming Freshmen Who Applied for the 2019 Purdue NYC Alumni Club Scholarship! The Purdue Alumni Club of New York City raises funds for a $1,500, merit-based scholarship for incoming freshmen entering Purdue University. The scholarship is provided by Purdue alumni and friends who have generously donated to support the next generation of Boilermakers living in the Metro New York City Area (Manhattan, Brooklyn, Queens, Staten Island, Bronx, Long Island, or Westchester). Applications for 2019 were due by March 1, 2019, and this year's scholarships will be awarded on May 1, 2019, for students beginning the 2019 - 20 academic year. We look forward to sponsoring another scholarship in 2020! We have received our latest shipment of Purdue NYC Scholarship Shirts, which have a new design that looks great! We also have three different styles of shirts to choose from this year. Proceeds go to the Purdue NYC Alumni Club Scholarship Fund, which benefits Purdue students hailing from NYC. Shirts are available at Game Watches and other Purdue NYC events. If you don't want to wait and would like to order your shirts right away, please contact us for details. Purdue Day of Giving is an annual online-based fundraising event taking place this year on April 24, 2019. For 24 hours, alumni and friends are encouraged to give back to grant opportunities and transform lives at Purdue. When you do so, please direct your donation to the Purdue Alumni Association's link for the Purdue Alumni Club of NYC so that your donation can help to provide merit-based scholarships for incoming Purdue University freshmen from the New York City Metro Area. Donations may be directed to the Purdue NYC Alumni Club on the Purdue Day of Giving Website (also, you can do so for donations that you may make throughout the year). Thank you for your support! A private screening of HBO's STUDENT ATHLETE, followed by a conversation with the filmmakers on this hot topic! 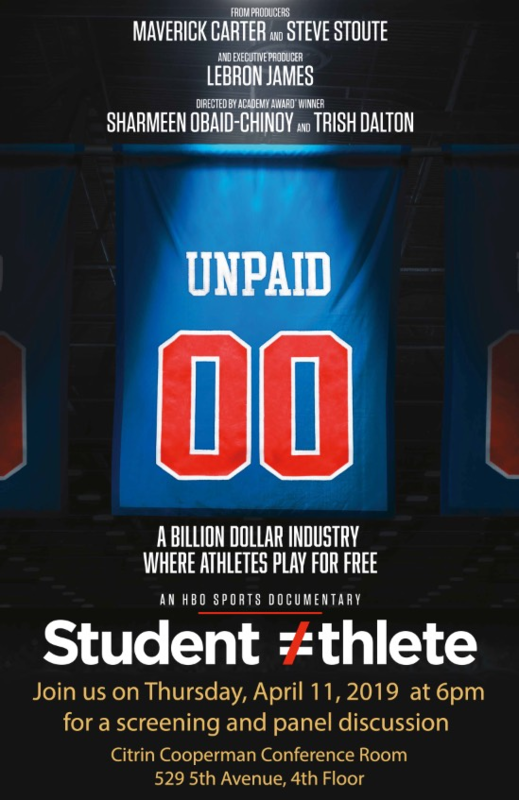 Student Athlete unveils the exploitative world of high-revenue collegiate sports in the United States, through four highly ranked mens basketball and football players at different stages of their athletic careers, a coach turned advocate, and a whistle-blowing shoe company representative ready to expose the money trail. This event is Free to attend with limited seating. Tickets are required. Doors open at 6:00PM. Screening starts promptly at 6:30PM, followed by a panel discussion with the filmakers at around 8:00PM. Light refreshements will be served. Join Purdue Alumni for all regular season football and basketball games at our game watch HQ, which has been moved to Dewey's Pub (135 W 30th St.). Purdue Alumni teamed up with the Big Apple Big Ten to help clean up a local park in The Bronx as part of NY Cares Day. Everyone had a great time at the Purdue Alumni Association tailgate party before cheering on Purdue's football team against Rutgers! Connect with Purdue Alumni during events coordinated by the Purdue NYC Alumni Club throughout the year. Stay in the loop on all things Boilers in the Boroughs. Preparing to move to New York but don't know where to start? Want to connect with New York alumni in an industry you are passionate about? Drop us a line!